How many violations does your company have? Every business owner knows how important it is to adhere to the fire code recommendations. These codes are set by the NFPA in order to make sure your business as well as your employees are safe from possible harm. But what exactly are these codes? Well, let’s take a look at six common fire code violations you could be doing in your business. While this violation may seem obvious, it is one of the most frequent fire code violations. Blocking passages and exit doors is a particularly common event in busy workplaces. These exits are often blocked by unattended packages, deliveries waiting to be put away, trash, boxes, and carts. Blocking passages and exits are extremely dangerous as they could impede people trying to exit the facility in an emergency. Many business owners assume a typical Exit sign is enough to point people to their fire exits. But this is simply not the case. It is important to every exit light to be illuminated and placed at a position where it can be easily seen in case of an emergency. Ignoring inspections and maintenance of fire extinguishers are one of the most common violations. All fire extinguishers in your business should be regularly inspected and maintained by a professional service like Fireline. A fire extinguisher should be refilled after a single use and should be inspected after every use and once per year. 4. Ignoring Fire Alarms, Too. 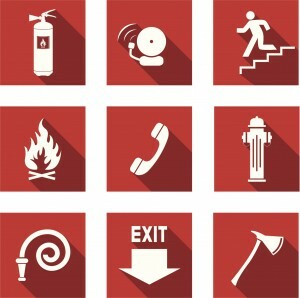 All fire alarm systems should undergo an annual inspection in order to protect your business. Unfortunately, many business owners ignore this code or do not keep suitable records for these inspections and what maintenance is needed. Smoke detectors are often in violation of the fire code because of they are not often in full working order. Smoke detectors should not be obstructed and should be in every room of your facility. Many of these detectors are in violation because they lack fresh batteries or are not functional at all. Although the fire doors are meant to be opened in the event of a fire, many businesses leave them wedged open to promote airflow in the facility. But leaving these fire doors open can actually cause problems and a hazard if they are not propped properly. If you insist on propping open the doors, you should only use an approved device. These are just some of the most common fire code violations that may be found around your business. For more information on protecting your business, call Fireline today! At Fireline, we offer an array of portable fire extinguishers, fire alarms, and sprinkler systems to keep commercial kitchens safe. Fireline offers the highest quality alarm systems to keep your business safe from fires and carbon monoxide poisoning. We also offer fire suppression systems as well to help keep commercial fires controlled should they break out. Our trained technicians will work with you to determine which air sampling smoke detection system is best for your business. We will also help install and maintain the system for your commercial building. To get started with Fireline today, or for more information on sprinkler systems call us at 1-800-553-3405, or visit our contact page. Be sure to “Like” and “Follow” the official Fireline page today on Google+, Facebook, Twitter, and LinkedIn. This entry was posted on Friday, September 30th, 2016 at 10:44 pm. Both comments and pings are currently closed.